General Meyer's War Journal--"Columbus Does Not Fall Today"
I had so much fun writing this one. Midway through the fourth quarter yesterday I was certain I'd have to make lemonade out of some very bitter lemons, but the Buckeyes came through, and they gave me a story well worth writing. The victory was a great birthday present for me. Soon I will be with you again, and together we will parade through the streets of Columbus like the victorious Romans of old. For now there is still much work to do repairing the damage of the battle, tending to the wounded, and seeing that prisoners of war are treated in a manner befitting Christians. 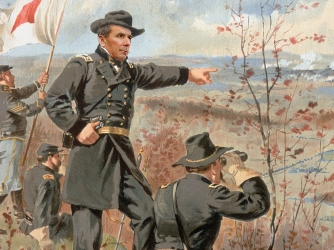 Even as I write this, surrounded by the tangible evidence of our hard-fought victory—the powder-singed flags, the howitzer craters surrounding the outskirts of Columbus, the bandaged enlisted men singing Carmen Ohio—I can scarcely believe what transpired yesterday. And yet it did transpire—the coming of morning proved it to be true and not simply the fevered dream of an old battle-weary soldier. We could scarcely have begun our battle against General Franklin and his Army of Pennsylvania on worse footing or with worse luck. In the opening salvos of the battle, Franklin’s sterling cavalry officer Lieutenant Barkley led a devastating charge through the middle of our lines, utterly breaking them before they even had a chance to establish themselves. Our first attempt at a counterattack proved equally damaging, as not only did we fail to dislodge the attackers, but we also lost Sergeant Campbell, one of our best men, to injury. As we attempted to regroup and resist total encirclement, ill-discipline, ill-luck, and wavering morale plagued us at every turn, while the men of Pennsylvania seemed to have God on their side—not to mention the sun. By the halfway point of the battle, we were not quite beaten, but encircled, cut off from our supply lines, and utterly dispirited. The last of our defensive lines began to fall, as trenches, gambions, and palisades offered little resistance to the now nigh-unimpeded Army of Pennsylvania. Soon they were within the city limits of Columbus. No doubt you heard the sounds of battle as their forces entered our fair city. I can only imagine your fear, your trepidation as those uncouth picaros began marching through our very streets, General Franklin and his adjutant Captain McSorley at their vanguard. All seemed lost, but then, in the midst of the sound and fury and the choking fog of powder, I heard the sound of drumming. But it was not drumming—it was the steady fire of a gatling gun. Corporal Denzel Ward had somehow managed to drag a gatling gun onto the rooftop of a post office, and now in prime position he laid down a withering field of fire upon the heads of the enemy infantry, singlehandedly blocking and blunting their charge. But it all would have been for naught were it not for what transpired next. I heard—we all heard—the brassy notes, the clarion call, of a cavalry bugle. And then we all saw Captain Joseph Thomas Barrett IV on his horse, saber in hand, charging into the bayonets of the enemy infantry. Never once have I seen such bravery, such obstinate, unlikely, reckless valor from a fighting man. Hacking through their ranks, Barrett seemed untouchable atop his mount, the bullets themselves afraid of getting in his way. And indeed it would not. With Colonels Wilson and Schiano and Majors Coombs, Studswara, Smith, and Johnson at my side, I joined the fray, charging with saber and pistol in hand. I witnessed such uncommon mettle in those following moments they could scarcely be believed. I saw Corporal Bosa and Sergeant Hubbard capture an entire enemy platoon on their own. I saw Private Dixon charging by himself into the captured grammar school and flushing out the squad that had taken position there. I saw Master Sergeant Baugh seize General Franklin’s own battle pennant as the General himself abandoned it, so complete was the reversal of fortunes. There will still be battles to fight in this War of Fourteen Armies, but in overcoming insurmountable odds and defeating perhaps our most powerful rival, we have taken control of our own destiny, and who but a fool would stand against us now?